The quiet, little town of Laie sits on the northern shores of Oahu, far from the hustle and bustle of Honolulu. With only about a dozen roads, Laie has traditionally been a classic example of small-town Hawaii. 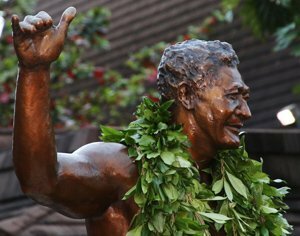 But a few great historical figures have emerged from this tiny town, putting their permanent fingerprints on Hawaiian culture and creating pop culture influences that are recognized and adopted all over the world. You may not know these people by name, but you are certainly familiar with their accomplishments. Have you ever heard the music of the steel guitar? Have you ever flashed the “hang loose” hand sign (“the shaka,” in Hawaii)? These and many other contributions to popular culture come from Laie and its native sons and daughters, whose impact stretches well beyond the small town’s borders. The inventor of the steel guitar—that special twangy guitar used in island music and honky-tonk songs—is Hawaiian music legend and Laie native Joseph Kekuku. He invented it when he was just 13 years old. As a young teenager in rural Oahu way back in 1889, Kekuku was walking down a dirt road with his trusty guitar and saw a rusted steel bolt sitting on the ground. He picked up the bolt but accidentally knocked it against one of his guitar strings—and fell in love with the sound it made. He practiced it again with pocket knives, steel combs and all sorts of other steel objects while sitting with the guitar face up on his lap. He would soon invent the steel bar that is still used today, and the style with which the steel guitar is still played. Kekuku went on to great fame and fortune and toured the world with his island guitar group, Kekuku’s Hawaiian Quintet, in the 1920s and ’30s. The invention of the electric guitar in the ’30s led to increased interest in the steel guitar. While popular in Hawaiian music and surf music, the steel guitar is still often heard in country and Western music. If you don’t know the sound of the steel guitar, listen to legendary 1959 song “Sleep Walk” by Santo & Johnny, which has been covered by dozens of well-known pop musicians and used in countless automobile commercials. A statue of Kekuku now stands, or, rather, sits in Laie. Kekuku’s statue depicts him sitting down playing the guitar on his lap, and visitors can sit next to him. Yes, you too can sit and have your picture taken with the man who invented the steel guitar. The shaka, or “hang loose” sign, is attributed to legendary 20th century fisherman Hamana Kalili. The sign is a universal symbol for the Hawaiian ethic of aloha, friendliness and happiness. But Kalili’s original reason for giving the shaka was anything but happy. The poor guy had his three middle fingers chopped off in a sugar mill accident. This would not dampen Kalili’s positive disposition. He used his “thumb and pinky out” as a hello gesture, which caught on with local kids and then the first major wave of US tourists after World War II. The shaka is still flashed regularly all over the Hawaiian islands, and Kalili also has a statue in Laie. Known in his day simply as Charlie Goo, he ran the most popular grocery shop in Laie in the 1950s. His grocery, convenience and toiletry shop, called Goo’s Store or the Old Plantation Store, was the essential lifeblood of Laie in the pre-supermarket era. Goo let the poorest residents of Laie pay on credit, knowing that many could never pay him back. Goo lost money, but he never stopped giving to the community. Goo is remembered today with Goo’s Plantation Store, a souvenir and gift shop at the Hukilau Marketplace in Laie that pays homage to his work ethic and generosity. Some of these legends of Laie are still with us today. Aunty Nona Warner served as a seamstress and master cutter at the Polynesian Cultural Center in Laie for nearly 50 years. During that time, she handcrafted tens of thousands of employee uniforms and costumes for the PCC’s celebrated luaus and shows—often freehand and without using patterns. Aunty Nona is honored today with Nona’s Tropical Threads, a tropical and resort apparel shop also in the Hukilau Marketplace. Like these people, Laie has come from humble roots to bigger and better things with a new wave of shops and restaurants emerging. Come enjoy the beauty of the northern shore of Oahu and the Hawaiian Islands and feel the legacy of these legends in Laie. This article is brought to you by the Polynesian Cultural Center—all of Polynesia in one place. Click here to register for tours, luaus and special packages. Book tickets 10 days in advance and receive 10 percent off!